I want to tell you about the swing that swings itself. 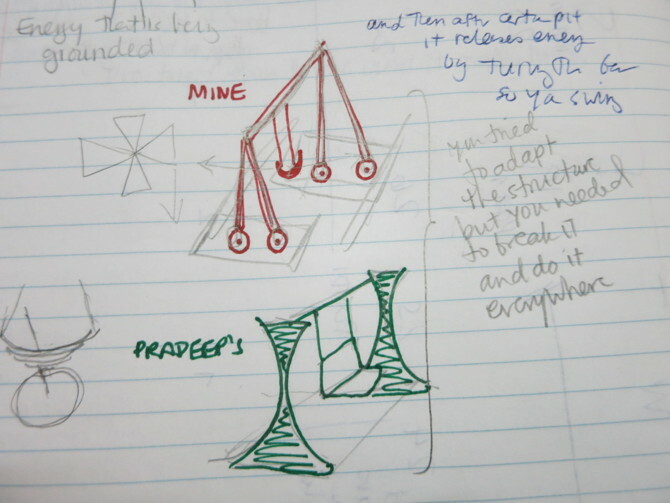 For two days Pradeep had me wondering and drawing diagrams, scratching my head and making my arms move like swings. I must have been funny to watch but I couldn’t figure it out. I couldn’t figure out any way to stop the energy of the swing from going into the ground. And he drew it for me and explained. Immediately I saw what had gotten me stuck. I thought that a swing could only have one kind of structure. A bar across the top and two bars on each side, making triangles with the base on the ground. Draw a swing for yourself and you’ll know what I’m talking about. What I kept trying and failing to do was to add things onto this structure to make it conserve energy. I kept trying to find a use for springs, wheels and gears. Pradeep’s solution was to change the way the swing itself was structured. Instead of the triangles on the sides, he designed metal spring-like sides that could compress and extend to give back the energy of the swing. “You tried to keep the main structure the same and just add onto it. I tossed it out and made something new. There is a lesson in that.” He said. Today I did some more writing. I finalized part one of the guide and I’d like to test out titles with you. Without knowing what the book was about, which title would you pick up in a store and want to read? Which link would you click on if sent in an email? Some of them are Pradeep’s and some are mine. I won’t tell you which ones. Congratulations, You’re Alive! Now Act Like It. “Hmm. There will be something about boxes, I fear” you say. He was worried that the story was not true. There are lots of cases of cons like these where people will claim to be in dire circumstances and ask for money. This is how they make a living. What he normally does, he says, is never give money directly. Always give something else – like food, or bus tickets – that way it can’t be saved or spent on other things. Shibani listened to the story and knew that it was not true. There were too many details, the woman would not give her the phone numbers of any of her relatives and she was asking for a very particular sum of money. Shibani gave her a little money, a dry shirt and then sent her on her way, but not before taking a picture of her with her phone. “If I ever see you again in Bhopal, we’re going to the police station” she said. “Why do people do that?” I wondered. It seemed like a very risky ‘career option’ for me. Do people choose to do it or are they forced into it? “It’s pretty easy money. I see these kinds of people all the time. I’ve heard lot of stories. Well, I don’t know exactly why they do it. It’s a good question. My thought is always this: if you can put effort into this con, you can put effort into an honest job.” said Shibani. And yet, there is always the chance that someone’s story might be true. So do you never stop for people? It’s a tough question. This entry was posted in Stories and tagged socialinnovation, swing. Bookmark the permalink.